In this SAP Press book chapter excerpt, find an introduction to SAP Extended Warehouse Management (EWM), including its history and how the application has evolved. efficiency of warehousing environments. In this SAP Press book chapter excerpt, learn the history of the SAP EWM application and discover how this software has evolved to meet the demands of SAP customers. This text provides you with the information you need to understand the SAP EWM solution, including the functions that it supports, how to set up those functions, and how to get started with a project that will utilize those functions to support your warehouse operations. In this chapter, we will start by providing some background and history on SAP’s warehousing applications, tell you how SAP EWM evolved, inform you about the variations of the EWM brand, and tell you who this text is for and how to use it. We hope that the text serves to inform and educate you and help you make the right decisions regarding your EWM implementation. This excerpt from SAP Extended Warehouse Management: Processes, Functionality and Configuration by M. Brian Carter, Joerg Lange, Frank-Peter Bauer, Christoph Persich, and Tim Dalm is reprinted here with permission from SAP Press, copyright 2010. Download a PDF of this chapter. In the past few decades, warehouses have evolved from simple receiving, storage, and shipping facilities to full-scale, high-volume, flow-through distribution operations. Global competition has driven businesses to hold less inventory and to get their products to market both faster and with more precise timing than in the past. Competition has also driven both local and global corporations to become leaner and more efficient and to react faster to both changes in the marketplace and in the internal business environment. Constantly shifting business priorities, increasing seasonality of products, faster business cycles, and more frequent mergers and acquisitions are just some of the market conditions that lead to intense pressure on warehouses to increase efficiency while still providing flexibility to the business to allow it to react to changing demands. At the same time, disproportionate increases in costs of labor, raw materials, and real estate threaten to drive warehousing costs higher, impeding companies’ ability to make a profit. For some companies, this pressure to perform effective logistics operations is too great or comes at too great a cost, and they are increasingly turning to outsourced solutions, such as third-party logistics providers, to cost-effectively handle the volumes of products and ever-changing business requirements. 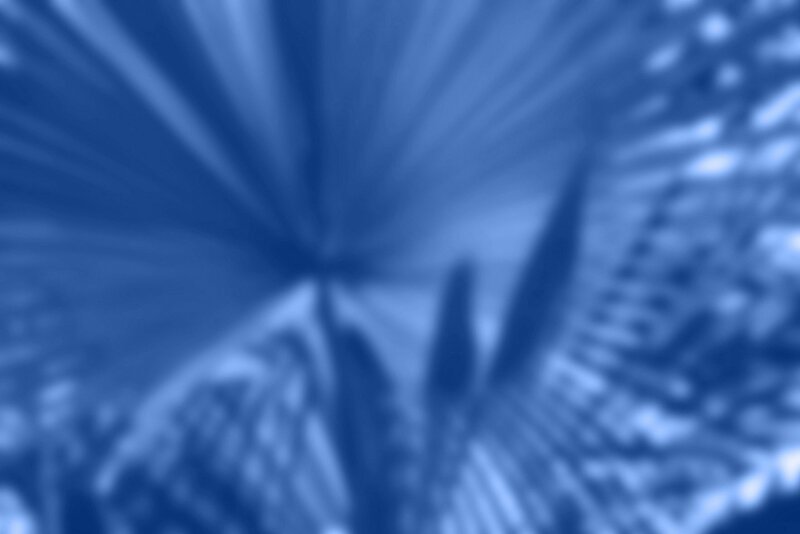 However, this just shifts the burden to a whole new group of people, upon whom the pressures are even more intensified by the need to not only maintain flexibility for a single organization, but to maintain flexibility across multiple organizations. To top it off, those organizations often have very different products, processes, business requirements, and management styles. This increase in pressure on warehouses to do more with less has led to a corresponding increase in the complexity of business processes. In turn, this increasing complexity of business processes then requires both an increase in talent of warehouse managers and an increase in capabilities of the systems that help those managers run their businesses. The evolution of the warehouse management system (WMS) software industry has run parallel to the changes in the warehousing and distribution marketplace, with ever-increasing business process capabilities supported by more and more capable WMSs delivered by companies who specialize in standardized software. However, there are still companies who prefer to run their own bespoke systems filled with functionality specific to their own businesses and supported by armies of programmers. But more and more, those companies are realizing the benefits in the total cost of ownership (TCO) of using standard software solutions that also meet their business needs. And those companies are turning to software vendors like SAP for their software solutions. Since 1972, SAP has specialized in providing standard software solutions for common business processes. Since the first release of R/1 a year after the company’s founding, SAP has constantly evolved their products to expand into new markets or to match the changing business needs of their customer base. Through the R/2 days in the late 1970s and 1980s, SAP delivered software to not only meet the needs of back-office functions like finance and purchasing, but began to move more and more to the front lines of managing the product manufacturing, sales, and distribution. In the early 1990s, SAP delivered its flagship client-server product, SAP R/3, and it has continued to enhance that application throughout its lifecycle. The SAP R/3 product evolved in the early 2000s into what is today known as SAP ERP. In the meantime, starting in the late 1990s, SAP began to deliver, in addition to its core ERP functions, specialized functions for Customer Relationship Management (CRM), Supply Chain Management (SCM), and Business Warehousing (BW). The collective release of these products was dubbed the “New Dimension” products, representing a new dimension in enterprise software. In the 2000s, SAP continued to refine and expand those products, delivering release after release of new and revised functionality. As part of this wave of new and expanded functionality, SAP delivered the first release of SAP EWM in 2005. At the time, EWM was part of the SAP SCM solution and could not be delivered separately. Since then, SAP has delivered the capability to deploy EWM as an addon to SAP ERP, allowing EWM to break free from its SCM roots and enjoy its own product naming and branding — SAP EWM. In this text, we will discuss SAP EWM, including its history, configuration, implementation, utilization for solving common business problems, and extension to solve implementations specific business problem. We will discuss the functionality of the latest release, SAP EWM 7.0. Unless otherwise specified, all screenshots and product descriptions are specific to the SAP EWM 7.0 solution. Even as early as release R/2, SAP contained functionality for locating products in the warehouse. At the time, it was a basic locator system, but it provided the baseline for SAP’s foray into the warehouse management (WM) world. In 1993, SAP released R/3 Release 2.0 and with it, its first warehousing application on the client server framework. Back then, SAP WM only covered the basics of a warehousing application, namely to track product in multiple bins in the warehouse and assign pallet identification labels, or pallet IDs, to the product in the bin. In SAP parlance, these pallet IDs were known as storage units. In parallel, businesses around the world started to use the SAP WM system to manage more and more complex warehouses and distribution centers. As the product grew, the customer base grew with it, and today, SAP WM is deployed by more than 5,000 SAP customers worldwide. In 2005, SAP released version 5.0 of its SCM software, and with it, released the first version of its SAP SCM EWM software. This version of the WM software was completely separate architecturally from the SAP WM from ERP. Although they shared some common themes in terms of capabilities, the SAP EWM was designed from the ground up with the needs of complex, highly automated, high-volume distribution centers in mind. Following Release EWM 7.0, SAP will convert the SCM platform, including EWM, to the enhancement package model for deploying new functionality. This model has already been employed on ERP following the release of SAP ERP 2005 (or what is now known as SAP ERP 6.0), and now the same model will be utilized for SCM, CRM, and the other major SAP business applications. The enhancement package model allows SAP to deliver enhanced functionality through regular updates between major releases. The updates can be activated as needed via business functions. The business functions contain a set of similar or related functions, allowing you to decide which business functions to activate without requiring you to activate all of the functionality delivered with the enhancement package at once. This can save you considerable time in testing the application of the enhancement package, because you only have to test the functions that are affected by the activated business functions. In turn, the business functions allow you to deploy the functionality to your end users faster. And the enhancement package model allows SAP to bring new functionality to market faster, making it a win-win for everyone. The first enhancement package for SAP EWM is scheduled to be released in mid- 2010. The functions will be delivered in separate business functions, which will allow you to install the enhancement pack and then activate one or all (or none) of the business functions and test your solution accordingly. In the coming years, SAP will continue to add additional features to the EWM 7.0 release through enhancement packages. When SAP released its SAP R/3 Enterprise Extension Set 2.0 functionality to support yard management, cross-docking, and VAS, it assigned the informal name Extended Warehouse Management to this collection of new functions. Though you wouldn’t find this name anywhere in the system, the features were collectively referred to using this moniker so that SAP employees and partners could effectively discuss the new features with their customers. One common point of confusion is that the EWM brand, as it applies to ERP WM, does not include the function Task and Resource Management (TRM). TRM was released with SAP R/3 Enterprise Extension Set 1.1, whereas the EWM naming only applies as of R/3 Enterprise Extension Set 2.0. What is also sometimes confusing is that the EWM naming does not even apply to all of the features that were delivered for SAP ERP WM with Extension Set 2.0. For example, dynamic cycle counting, the functionality that lets the user walk up to a storage bin in the warehouse with a Radio Frequency device and initiate an ad hoc cycle count, was introduced with Extension Set 2.0, but it is not included in the EWM features. The only three functions that are included in the EWM brand as it applies to SAP ERP WM include cross-docking, yard management, and VAS. When SAP delivered SAP SCM 5.0 in 2005, it also delivered EWM. 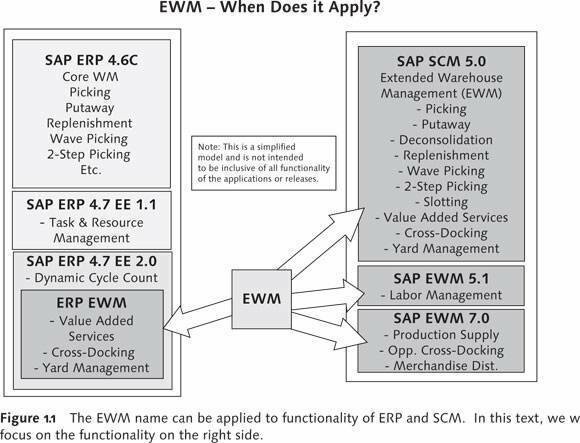 As mentioned previously, this version of EWM was related to SAP ERP EWM in name only. The SAP SCM EWM was delivered on the SCM platform, completely separate from SAP ERP and without any direct link to SAP ERP WM or SAP ERP EWM. It uses different tables, different structures, and different program from the ERP application. In some ways, it uses the same concepts and paradigms, but in other ways, it is significantly different and even performs the same functions in uniquely different ways. To hopefully make it more clear, Figure 1.1 provides a visual diagram of the functions to which the EWM is used to refer. However, in this text, we will focus on the right-hand side of the diagram — the SCM EWM. In 2007, SAP decoupled EWM from the SCM Basis layer so that the company could prepare to deploy the solution as an add-on to ERP. An add-on is a product that can be deployed on top of another application platform without being coupled to or dependent on the underlying software technology architecture. Allowing the EWM to be deployed as an add-on would mean that businesses of all sizes that did not necessarily have the skills, manpower, or funding to deploy an SCM server could deploy EWM on their ERP server and enjoy the benefits of the latest warehousing applications. As briefly mentioned earlier, in 2005, SAP announced that it would migrate its ERP application to the Enhancement Pack model and that the ERP 2005 release (which it later renamed ERP 6.0) would be the “go to” release for the next several years. This Enhancement Pack model allows SAP to deliver new functions in a quicker way and allows customers to implement those new functions more quickly and easily by giving customers the freedom to choose which business functions to activate after implementing the enhancement pack. EWM – When Does it Apply? Figure 1.1 The EWM name can be applied to functionality of ERP and SCM. In this text, we will focus on the functionality on the right side. When SAP delivered its second Enhancement Pack for ERP, SAP ERP 2005 Enhancement Pack 2, in 2007, it made good on its promise to allow EWM to be deployed as an add-on to ERP. Now customers have the choice of whether to deploy EWM on the SCM platform or on their existing ERP platform, giving them the freedom to provide all of the functionality on the right-hand side in Figure 1.1 on the ERP platform. In Chapter 26, Deploying EWM, we will further discuss the option of deploying EWM as an add-on to ERP. In this text, we intend to provide knowledge, information, and reference material for project leads, implementation consultants, project team members, business analysts, and business users who are responsible for implementing, maintaining, or problem solving for the SAP EWM solution. Key decision makers who need to understand the application well enough to decide how and where to deploy EWM may also find the text useful in their decision-making processes. The text will cover an overview of the capabilities of the EWM solution, the configuration elements available in the standard solution, the methods used to solve common business process problems, plus the possibilities to extend the solution to meet more complex or unique business requirements. The text will provide both detailed system configuration and setup instructions, and descriptions of and solutions to common business concerns for complex high-volume distribution operations. Following the introduction, the second section of the text will cover the basic warehouse setup, including the warehouse structure, warehouse master data, stock management, and warehouse document types. This section will provide a baseline for understanding the remaining sections and will also provide a reference for users who are getting started with an EWM implementation. The third section will cover configuration and setup for basic warehousing processes, including inbound processing, outbound processing, internal movements (including replenishment and rearrangement), and physical inventory. The fourth section will cover special cross-topics such as cross-docking, yard management, VAS, and data capture (including mobile data entry using radio frequency– enabled devices and RFID). The final section and the appendix will provide conclusions, a list of common abbreviations, and the index. If you are not familiar with the SAP warehousing terms already, you may want to check the index or the online glossary (available in the SAP Online Help at http://help.sap.com/saphelp_glossary/en/) before you continue, or you may find it helpful to refer to them periodically as you read through the chapters. text and find it both interesting and useful. In this chapter, we introduced SAP EWM and described the contents of this text. Hopefully, this gives you an idea of what this text is about and how to use it. In the next chapters, we will describe the organizational structure and master data for EWM.